Father, in the name of Jesus Christ, I cry out for all whose spirits feel broken, for brokenness can be unbearable. 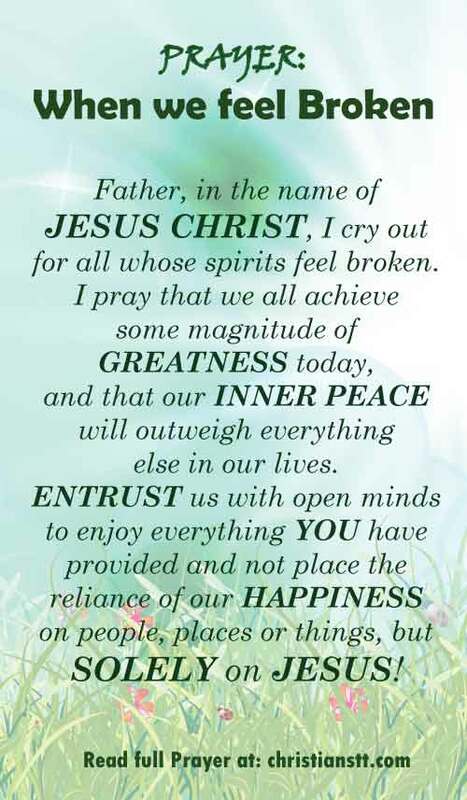 I pray that we all achieve some magnitude of greatness today. Let our inner peace outweigh everything else in our lives. Entrust us with open minds to enjoy everything You have provided and not place the reliance of our happiness on people, places or things, but solely on Jesus! We look to You for restoration and success in all that we do. We will not be held back due to circumstances. Rather we will study Your Word, listen to Your direction and follow your instructions. All this while in complete obedience to You. Psalm 51:17 – The sacrifices of God are a broken spirit, a broken and a contrite heart – these, O God, You will not despise. Psalms 147:3-5 – He heals the brokenhearted and binds up their wounds. He counts the number of the stars; He calls them all by name. Great is our Lord, and mighty in power; His understanding is infinite. Almighty God, in directing us to our calling, I trust that You will grant us the confidence and strength to accomplish whatever You place before us. Help us to find joy in You and not be concerned with things of this world. Walk with us, talk with us and guide us as You lead the way. Matthew 9:22 – But Jesus turned around, and when He saw her He said, “Be of good cheer, daughter; your faith has made you well.” And the woman was made well from that hour. I am so grateful, Father, that You speak to us through Your Word. As we meditate on it, make it come alive within us. Thank You for the blessed gift of LIFE! Romans 5:3-5 And not only that, but we also glory in tribulations, knowing that tribulation produces perseverance; Now hope does not disappoint, because the love of God has been poured out in our hearts by the Holy Spirit who was given to us. I praise You in the morning, Lord, and at noon and at every possible opportunity. I worship You as my heart sings with joy and love because of who You are. You are the Great I AM, my refuge and my strength, you have become my salvation and the author and finisher of my faith. At the sound of Your name, every knee will bow and every tongue will confess that You are Lord over all. These mercies I pray in no other name but the matchless name of Jesus Christ, SO BE IT…AMEN! Psalms 34:18-19 – The Lord is near to those who have a broken heart, And saves such as have a contrite spirit. Many are the afflictions of the righteous, but the Lord delivers him out of them all. Galatians 2:20-21 – I have been crucified with Christ; it is no longer I who live, but Christ lives in me; and the life which I now live in the flesh I live by faith in the Son of God, who loved me and gave Himself for me. I do not set aside the grace of God; for if righteousness comes through the law, then Christ died in vain.